This time last year, I was about a month into a project to do a podcast episode every day about women in STEM. And I'd recently discovered Katherine Johnson, and through researching her I discovered Dorothy Vaughan and Mary Jackson. I immediately added these women to my list of who I wanted to feature on the podcast, along with a few other African-American NASA engineers. Then not long after that, I saw the first news report about Taraji P. Henson joining the cast of a movie about Katherine Johnson. I found out about the book Hidden Figures, and I was incredibly excited. As the casting notices came in, I only became more interested in the film. I read excerpts from the book in my research (it hadn't been released by the time we'd done our episodes on each of the women, but the author's research was invaluable to our own). Suffice it to say, this was a highly anticipated movie for me. I was sad I wasn't going to be able to see it during it's limited release right after Christmas, but now I'm incredibly glad that I got to go on it's "opening weekend" because my ticket helped it become the top box office draw that weekend. Which is just amazing on so many levels. Go see this movie. As soon as possible. Preferably immediately. The acting is amazing, the story is compelling, the art direction and design are perfect. As a historical drama, it hits all the notes it needs to. It felt to me like it didn't pull any punches, but it didn't set out to tell a tragic story but an inspiring one. And it accomplishes that with a skill and style that stories like this are rarely afforded. It is above all an emotionally affecting movie. You feel for these women and you care about what's going on. In the theater I was in, there were cheers and applause throughout the movie, and a huge round of applause at the end. I've heard similar reports from people around the country, in many different demographics and regions. Audiences care about this movie, and it's easy to care. These women are inspiring, and not just because the actresses who play them are inspiring, but because they actually were inspiring. They've been inspiring me for a year now. Even though I know exactly what the outcome is of the historical events in the movie, I still was caught up in the tension. And it was amazing to see a piece of history we've lost a piece of, a time when people came together to create science and math that didn't exist before. And the movie acknowledges that we did this because of fear of the Russians, but it also reminds us how much benefit we got from these geniuses, including the African-American women of the West Area Computers, being allowed to do what they do best. And they got us to the moon. The movie challenges us to wonder what they could do now if we made that kind of effort again. So go, just go. Go see it. Please. And take any kids you know to go see it. So, this last week my best friend and I did a whirlwind tour of some of the theme parks around LA, including a trip to Universal Studios Hollywood. 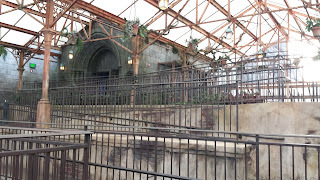 There's more than enough to fill several posts, but I thought I'd start with just a quick review of the two rides that are part of the new park addition, the Wizarding World of Harry Potter. Most of the point of this park, which is done up like Hogsmeade, is the ambiance and the shopping. Plus, Universal Hollywood isn't really as much of a theme park with a ton of rides and things anyway. So there are only two rides to speak of, and we eventually did them both. As you might recall from my coaster review from Busch Gardens, I'm not actually a fan of roller coasters or certain types of thrill rides. So I actually hesitated to ride either of these at first. As I mentioned in the article on Busch Gardens, I do a lot of research before I go to parks because it helps my coaster anxiety. But with these two rides, I didn't do that much because I repeatedly saw the same thing: the lines at Harry Potter are absurdly long. All the time. Just super long. At any other park, that would mean I would just say to utilize whatever their version of a fast pass system is. Everywhere else I've been recently has some kind of thing where you can get a ticket to come back during a certain time frame and bypass the longer line, so you spend that hour doing something fun instead of standing around. Universal doesn't do that. You can pay almost double the price of your ticket to get a one-time front of the line pass for each ride, or you wait in line. That's it. Which is unfortunate, because we didn't plan on riding half the rides in the park, and didn't have that kind of money. So we both assumed that the Harry Potter rides were out. Turns out we were wrong. I don't know what kind of luck we had, maybe it was because it was January and kind of cold, because it was raining off and on for a few days at that point, or because we were there at a different time of day than other people were, but it turned out there wasn't a problem with lines. When we got to Hogsmeade, the line for Harry Potter and the Forbidden Journey was listed at 80 minutes. Hard pass. But Flight of the Hippogriff was actually only 15 minutes at that point. I passed at first because the butterbeer had made me sick to my stomach. Cyn rode anyway, and said she ended up sitting next to an eight year old who tried to make sure she (my friend, who has been on many, many coasters in her life) wasn't too scared. It was adorable. But then later after we'd been wandering a bit I opened the park's app and saw that the line for Harry Potter and the Forbidden Journey was under 20 minutes. I couldn't remember details about the ride, because I hadn't researched much, but I decided to go for it. This was both a good and bad decision for a couple reasons. The castle is amazing, and we didn't really catch most of it because we were trying to get to the ride before the crowds came. Which was fine, but we totally should have turned around and gone back through the queue just to stop and see it all. It was beautiful. I don't have pictures inside the castle proper because I only had my cell phone and the light is too low for it to have worked well, but you can see it in the video. What I can't embed a video of is the ride itself. I've watched two or three and none of them are worth it, they don't capture anything about the experience. First, because it's a very dark ride mostly but also because the type of car/restraints mean that a fixed camera POV isn't going to work at all, you'll miss most of what you see from looking around and being actually present on the ride. Listen, I had no idea what I was getting into because I hadn't done my research. I was expecting a basic 3-D simulator ride, where you sit in a seat and it bounces around while a video plays in front of you. That is not at all what this ride is. You're in a car that has four seats, and you walk on a moving walkway to get into it. Then it's picked up at the end of the walkway, and your feet are dangling. At this point I'd love to know more about the mechanics, because it must be fascinating. But the ride becomes a mix of a simulator ride, where you're moving along with a 3-D video in front of you, and a traditional thrill ride. There are parts where you're being "tossed" around through the Forbidden Forest and a cave full of dementors, all using practical effects. There were some parts where I got a little antsy, but I would ride it again in a heartbeat. It was a ton of fun, and while I really hate waiting in lines, it'd be worth a longer wait for sure. After we got done with that, I decided I'd be fine with riding the Flight of the Hippogriff after all. I mean, I couldn't let an eight year old be braver than me, right? Besides, the ride was less than five minutes. The queue for this one is less built up, though you do get to walk past Hagrid's hut. Word of warning: the cars are tiny. I felt very cramped and uncomfortable, just because there was no foot room for me, and I'm super short. I can't imagine riding it if you're six foot tall. We rode at sunset, and it was absolutely beautiful, you really get to see the park on this ride. It's also my kind of coaster, if it was a launch coaster instead of a lift hill it would be perfect, though I guess then you wouldn't get the nice sunset. The whole ride is super, super short. And it's not that fast either. Actually, I ended up finding it kind of relaxing almost? It was just really pretty, and I could have ridden it longer. I can see why reviews say it's not worth a long wait, it definitely wouldn't be worth waiting more than maybe ten minutes for as an adult, but it's a fantastic coaster for kids. So those are the two Harry Potter rides, more about Hogsmeade next week! I'm not one of those people who feverishly keeps up with every new development at Disney, but I do pay attention because some of my favorite movies are Disney films. I do have a lot of fond memories of the Disney Princess movies too, though that might be surprising to some who know my tastes. But the thing is, I really love modern princess stories. They have a bit of a formula, and a certain set of tropes. But the modern princess story can be really amazing, and thoroughly enjoyable when done correctly. Moana is a princess story done correctly, and it is thoroughly enjoyable. It's also a fantastic example of the finest in the "Disney movie" style, as well as just being a really good film on it's own merits. I knew that Disney was working on Moana, and I'd seen a few pictures, but it wasn't until the first trailer was released that I started to get really interested. And it didn't hurt that Dwayne Johnson was involved, and posted a video of him recording his lines as Maui as a message on The Rock Clock. Plus I just really was looking for a good, optimistic, happy story. I'm just in a mood for more good emotions in my entertainment, and it looked like it would fit the bill. So I made some time about a week after it opened to go to the theater, and I am so glad I saw it on the big screen. You've probably read a million things about how amazing and lush the animation is, and those things are all true. Nearly every second is beautiful and inspiring. You've probably also read about the songs but I'll take a second to talk about them because I can't believe how much I love the soundtrack to this movie. I haven't been this obsessed with a Disney soundtrack in a very long time, probably since The Lion King. I loved a lot of songs in other movies, but there's only one music cue in the entire soundtrack that I'm not 100% in love with, and that's because it's 90% instead. Honestly, if We Know The Way isn't nominated for best song, then the Academy is officially insane. What you can also see in this clip is one of my favorite things in the movie, and that's the way they show the characters moving. I noticed it at multiple points in the movie the way that they animated dance and movements taken from traditional dances from Pacific Island cultures. I'm not a historian, and I'm especially not a historian of dance styles, but it's something that interests me and I was thrilled to see it peppered throughout the film. I had a similar reaction to the way that the traditional tattoos of their culture were discussed. This was a Disney princess movie where we not only see a character getting a tattoo, but between Grandma Tala and Maui there is a lot of talk about the significant of them. The fact that they didn't leave that out really impressed me, because I could see Disney wanting to sanitize that part. The movie is fun, it's paced perfectly, it's got a good message (more than one actually), likable characters, and it elicits genuine emotions. Pretty much every metric I could apply to it, it passes the test. I could go through and try to argue with some of the dissenters that have come out to complain about it. I especially would love to spend a lot of time taking apart the inane arguments made by the panelists on one of my favorite podcasts, but I don't feel like even acknowledging it. Moana is inspiring, it's enjoyable, and it's just a lovely movie. I highly recommend it. The Value of "Real Mail"
So, probably about a year ago I signed up for the Letter Writer's Alliance. It's a pretty small fee, and you get a cute little membership kit and access to part of their shop that is members only. But the biggest thing I signed up for is they do pen pals. I've done pen pal services before and they always kind of faltered, especially because a lot of them seem designed for like a one time exchange. I wanted to actually write back and forth and establish a real connection. So I signed up, and what they do is they send you one address, and they send your address to one person. So you get two pen pals right off the bat. In addition, at some point last year I started an effort to send two postcards and one letter each week to friends and family that have said they want to get more snail mail. In part because I like snail mail, and in part because I have literally an entire wooden chest full of postcards, stationary, and stickers and some of them have been in there since I was in middle school which was a very long time ago. And I told myself I couldn't get new stationary and stickers until I used up what I had (I've only kind of stuck to that, but done okay). It's been great. I don't get replies as often as I send things out, for sure, but I love putting together everything to send stuff out and it's a nice way to stop and do something non-screen related for a while. I put on some music (I can't do podcasts and write words) and write for a little while. I made a checklist to keep track of where I was in my rotation, so that everybody gets stuff pretty regularly. It's just on the graph paper in the back of my Passion Planner. I buy cool stamps, but I also get stamps in big packs so I don't have to worry about it that often. There's no bulk discount for stamps, but if you get forever ones you save some money if you have some when they go up. I've also gotten a few wax seal stamps and wax, but that's another post about how that's going. My pen pals from LWA have been great. I've really enjoyed getting to know them, and seeing what all we have in common. They're both very awesome women. A lot of LWA posts make it look like you have to do all this fancy mail art to fit in and that's definitely not the case, my pen pals do all that sometimes and not others. I will put together what I can depending on how busy I am, I figure I'd rather write a letter and send it than put it off until I can make it all impressive. The point is to write in the first place. I've been getting more mail, which makes me happy and making connections, which also makes me happy. And I know that I'm making at least a small part of my friend's days nice when they open their mailboxes too. Just remember if you start that it's not about getting replies (you'll get some, I'm sure, especially if you do pen pals) but it's about the joy of sending the mail. If you start from that, it'll be great. Send more letters in 2017!